Le Petite - Prairie Point Christmas and Happy New Year! It's done! My last project for 2010 is my December Le Petite - "Prairie Point Christmas" by Cara Wilson. I don't know why, but I had troubles trying to decide what I wanted to do for the borders. I wasn't sure if I wanted to go exactly how the pattern had the borders. I decided to do something a little different than the pattern. After MUCH auditioning last night, this is what I decided on. I love it. I'm very happy with how this project looks! I have temporarily added a little prim star button on the top to see how I like it. What do you think? I'm going to see if it grows on me and if it does, I'll attach it after I quilt it. Yippee, I have another project waiting to be quilted on my A-1!! I'm so excited. I'm counting down the days until next Wednesday when Jamie Wallen is coming over to set everything up!! Scott will be installing some cabinetry in my new quilt studio. He went and picked them up yesterday. Unfortunately for Scott this meant more heavy things to carry, but at least he could go down the stairs this time and not through the window! My studio only has one small window, so I didn't want to go with dark cabinetry. I chose a solid, natural maple with a Shaker panel door. The cabinets are Amish made in Indiana. The were sooooo affordable. I didn't want anything fancy, but after we priced stock cabinets at Lowe's, these were actually a better deal and better made! I love them! Looks like Sarge and Scooter do too! Scooter couldn't believe his good fortune yesterday. There were big boxes and long pieces of tape for him to play with. A kitty playground! I want to thank everyone for the very kind comments and emails I received regarding Elaina and our family. We cherished every one of them and read each one of them together as a family. I am so fortunate to have such a wonderful blogging "family". Family really IS everything. That sign hangs in my home above the door to our downstairs. I pass under it at least a hundred times a day! It's my friendly little reminder as I'm running downstairs to do the laundry! Wink. Wink. No really, I feel so fortunate to have been able to spend Christmas with my family. We went to my in-laws' on Thursday night. We celebrated with them and came home Friday night. My dad and my sister (of course Scooter) spent Christmas with us. AND my SIL, her husband and my baby niece stayed the night with us Christmas night!! We had a full house that night! Heather, Troy and Mayella (my SIL, BIL and niece) live is Southern California, so it was an extra special Christmas to have them with us too!! Mayella, isn't that the prettiest name? She's the most beautiful little baby too. She is named after Scott and Heather's grandma. Mayella is 10 months old and is already walking! She was so much fun. She sure kept us busy. I have forgotten how NOT childproof my home was! Elaina and Alyssa were the best big cousins EVER! They had a ball with their new little cousin! Unfortunately, I got sick over Christmas. I think it was all the craziness before Christmas just finally caught up with me. I spent Sunday sleeping ALL day! I apologize for my little absence from blogging, but I just couldn't pull myself together until Monday night. I still have a horrid sore throat and body aches, but no fever now. I'm trying to catch up with every one's blogs! Wow, a few days away and I feel so lost! Something about stitching wool is so soothing and therapeutic. 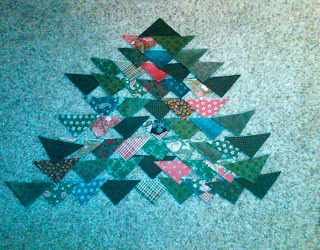 I started on my next block too. I need to get moving on this project. I want to have all my blocks done by the time I go on my quilt retreat the first weekend in February. Today, I'm planning on starting my Le Petite project. It's so cute! Not really sure if I'll make this deadline, but hopefully!!! I mentioned on Monday's post that Elaina was sick last Friday and missed her last elementary school class party. Elaina was not your "typical sick" like with a cold or the flu. Elaina suffers from a chronic illness. She was diagnosed several years ago with Cyclic Vomiting Syndrome or CVS. Her first episode or spell with CVS was when she was only 12 months old. What happens when she is sick, you ask?? During a spell, Elaina will be sick for 4 days. Elaina will vomit bile intermittently for the first 2 days. Sometimes she vomits 4-6 times in an hour. Poor thing will wretch and wretch. She spends the third day almost comatose. She only sleeps. When she does get up, we have to carry her. She is too weak and lethargic to do anything on her own. She may by the end of the third day sit up on the couch. By the fourth day, she is almost functioning normal, but she still has trouble walking or focusing on things. Her spells have grown further apart over the years. She used to suffer about every 7-8 weeks. Now she has a spell every 11 1/2 weeks to the day. The time in-between spells she is perfectly healthy. Some spells are more severe than others. Many who suffer from CVS claim to have a trigger. Maybe a food or excitement. Elaina is very difficult for doctors to understand because her spells come like clockwork. Only time is a trigger. We know EXACTLY when she will be sick. I mark the calendar and then pray in-between spells that maybe it will just never come. We have taken her to dozens of specialists. We've had countless trips to the ER over the years. We currently travel to the Cleveland Clinic to see a team of specialists there. Medications never work. They might just mask some of the symptoms or control the vomiting. We have tried everything from special diets to non-conventional therapies. Nothing works. No one knows the cause. Alyssa is her identical twin, but is not sick. Yes, it's been heart wrenching for us and frustrating as well. I always schedule events or vacations around when she supposed to be sick. I can literally look at the calendar 11 1/2 weeks from now and know when she'll be sick. I feel our only hope is that she might outgrow it some day. Now based on when Elaina was sick last summer, I knew at the beginning of the school year she would be sick either for her Christmas program or her party. Everyone at school was aware too and really pulling for Elaina that she would beat it this time and not get sick. So when she was sick on Friday everyone was devastated. I'm going to get emotinal as I write this, Mrs. Winchell (the girls' teacher) arranged and got permission to do something very special for Elaina. We got a call from the school explaining her plans. After a while, the doorbell rang and it was Alyssa accompanied by Mrs. Winchell and the whole class in our front yard! Scott told Elaina (who was in her pj's) shw needed to get her boots and coat on because she had a visitor, which just baffled her. When she opened the door, Elaina's face just brightened up and her smile went from ear to ear! Her class sang "Rudolph the Red Nose Reindeer" to her! They presented her with cards, including one from the principal. AND Mrs. Winchell gave Elaina a special little poinsettia! Elaina said it was one of the best days of her life! What an amazing teacher! Not only what Mrs. Winchell did for Elaina and our family, but also what she did for the rest of the class. She really taught them so much about the spirit of Christmas. I heard the kids were so excited when they got back to school! They were telling everyone about how much it meant for them to do that for Elaina. The story has spread through our small town as well. My family will never forget what Mrs. Winchell did for ALL of us. I know I heard a little bell ring that day because Mrs. Winchell earned her wings. Scott and the girls gave me this Santa last night. He is the 2010 Eldreth Pottery Redware Santa. I just love him! Scott and the girls give me a Santa every year before Christmas, so we have time to enjoy him. They chose to give him to me last night as a way to try and cheer me up. So now I lovingly refer to him as "The Cheer Me Up Santa." I'll get into why I needed cheering up last night in just a moment. First I need to wish my baby sister Kristin a HAPPY BIRTHDAY! Today is Kristin's 23rd birthday!! Kristin came home from the hospital right before Christmas when I was in the Seventh Grade. That Christmas was my most cherished memory from my childhood. 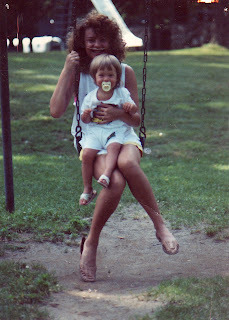 I remember my parents sitting around the Christmas tree, fireplace burning and me holding Kristin in my arms. I couldn't have asked for a better present! This is a well traveled (worn) photo of the two of us, but one of my favorites. You can clearly see my naturally curly hair in this photo!! Yikes! So looks like I may have jinxed myself after all. I said in yesterday's post that Wooly Wednesday would be abbreviated. If I would've known then what was in store for me last night, I would've said "NO Wooly Wednesday for me because I'll be too busy on the phone." I received a call while driving the girls to dance from... after much confusion, a freight company. The person on the line was doing a terrible job relaying info to me, so much so that I thought she had the wrong number. Silly me thought she was talking about a package I have been expecting from Primitive Gatherings. Not LOL, but it is kinda funny looking back. She kept saying they were making some delivery next Wednesday. Finally, I realized she was talking about my A-1, which is supposed be delivered Friday, like tomorrow. I totally didn't understand what was going on??? I told her it shipped Tuesday, why on Earth would it not arrive until NEXT Wednesday?? She had a million excuses, none of which made sense or should have been my problem. Now for a little background info...I arranged this delivery date with A-1 some time ago. (Right after A-1 received my check for the machine, paid in FULL, I might add) It was a compromise between us. I wanted the machine after Christmas and that didn't work for them. I cannot have it delivered the week of Christmas because our schedules won't allow it. It's just WAY too busy next week. I cannot take time off next week. So A-1 and I settled on this Friday. It's still not ideal for Scott and I, but we had to make it happen. We totally rearranged our lives to accommodate this delivery. So now fast forward to my horrid conversation with Ms. Unhelpful freight company person yesterday...I ask her "What are my options because next Wednesday absolutely will not work?" Her condescending answer to me was "I could refuse shipment." Really? Are you kidding me? If there was one time in my life that I could reach my small arm through the phone and wring the person's neck I was speaking with... THIS was that time! Realizing this person was no help to me, I hung up with her and called A-1 directly. I always feel that "sugar" gets me a whole lot further, meaning I always try to be really nice even when I'm upset. Well, initially A-1 wasn't getting it either. Honestly, I think they were just as confused as I was. I told them "Could someone please figure out this mess and call me back?" I may have not used those exact words. A-1 seemed pretty positive that I would get my machine Friday. I know A-1 is working hard to resolve the issue. They said there is no reason the machine should not be delivered on the agreed upon date. They are supposed call me today to confirm. We will see. A next week delivery is impossible for me, but I know I wouldn't have gotten so upset if the person I had spoken with initially hadn't been soooo unhelpful. I became so frustrated! Trust me this was shortened abbreviated version of the story. I apologize for my rant. I'm chuckling a little about it now. I'm not going to let it ruin my day like it did yesterday. Today, Alyssa and Elaina are in their school Christmas program! It's their last elementary Christmas program because next year they are off to middle school. Today is a special, sentimental and beautiful day! And it's Kristin's birthday!! Tonight will be an abbreviated Wooly Wednesday. Unfortunately, due the weather, I fell behind on a few errands this week. So tonight I need to do some shopping and finish up Christmas cards while the girls are at dance. I'm still going to get a little stitching in, just not my usual 3 hours. I have been trying to finish up some Christmas gifts. I'm really feeling the time crunch now. It's been difficult to stay on The Christmas Gift Express between working, Christmas parties and the usual preparations before the holidays. One of the projects I've been trying to finish up is "Bluebird Row." I have all the stitching done on the center design and it is fused to the background wool. I should have just enough time to stitch that down tonight. I love it! The little bluebirds are so sweet. Their little stick legs are my favorite. The stitching really makes a huge difference in the finished project! Do you see what I mean? The project not only doesn't look finished, but the stitching gives everything character and life! For some reason this kit did not come with a piece of homespun to finish off the back. The directions called to "block" the penny rug by placing a damp cloth over it and place your iron on it in sections, but not to iron back and forth. I'm not familiar with this. I've heard of "blocking" a quilt before, especially before you enter it in a show, but not on a wool penny rug. Is anyone else familiar with this method of finishing? I had yeah I did to place another order with Primitive Gatherings for a few things I conveniently forgot to order with my last order, so I had them throw on some of Lisa Bongean's homespun fabric to finish the back. I just really like the look of that. As soon as I receive it, I'll finish this project and be on to the next! 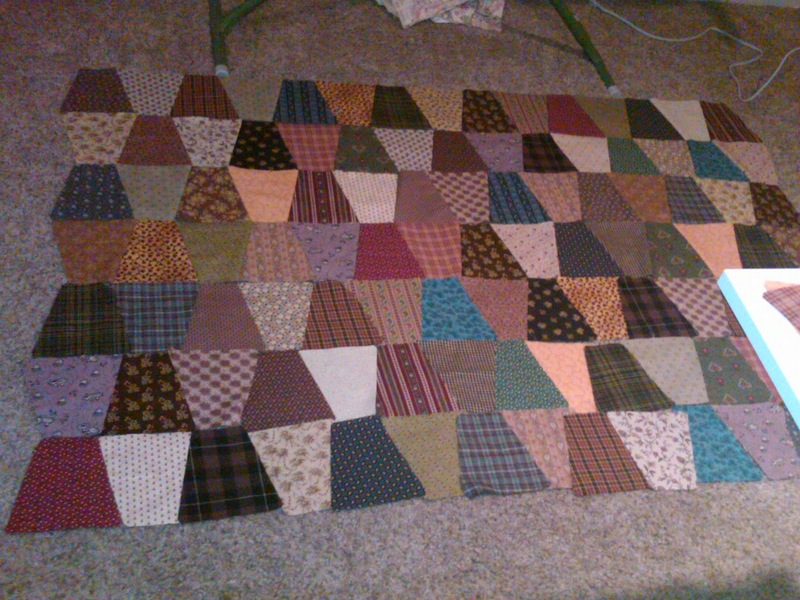 I have started a new quilt. This will be for my other twin daughter, Elaina. Her quilt, like her sister's will be made from the Bliss fabric collection by Bonnie & Camille. The pattern will be...drum roll please..."Toulouse" by Carrie Nelson of Miss Rosie's Quilt Co. I have loved this pattern ever since Nicole, Thelma, and Lisa posted each of their versions of "Toulouse" on their blogs! When Bliss came out, I knew this was THE fabric collection I had been waiting to make "Toulouse" with. "Toulouse" is one of those love at first sight quilts. I have been saving this pattern for just the right time when I would be ready. It IS crawling with my former nemesis, flying geese. After my therapy session with "Plan C," my fear of flying is cured and I have the perfect fabric, there is no reason for me to not make this beauty. I spray sized all my fabrics today. 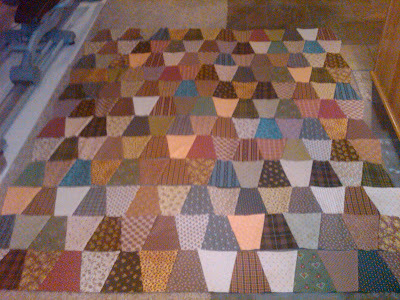 It's about the only step of the quilt process I dread, but it's done! I will start cutting the fabric this weekend. I am so excited to make this quilt. I hope the top will be completed by the New Year. It will be my last big project of the year, hopefully. Elaina is very excited as well! She has been super patient waiting for her turn! My house is pretty much all decorated now. We have one small tree to go up in the downstairs still. It is our green and white Michigan State Spartan tree. Very cute when it's done. Well, Scott says if the basketball team doesn't start playing better, we are not putting it up. R-i-g-h-t! He's full of hot air. He lives and breathes MSU, blood runs green. Wears his green heart on his sleeve for that team! He would never not put that tree up! I like to collect Santas. All sorts...prim, whimsical, old fashioned, etc. I have them displayed all through the house. I use the area above my kitchen cabinets to display a large collection of them. Normally, I have some roosters up there, but I remove them at Christmas time. Scott usually buys me at least one Santa every year. Several of the Santas are very sentimental to me because my grandma collected them too and I have several from her collection. Well, there's a little peek at my Santa collection! I hope everyone has a wonderful weekend! I know I will!